More than 80 vendors will be participating in West Chicago’s Blooming Fest this year, giving attendees of the downtown garden festival an opportunity to browse vendor booths of a wide variety. The event takes place on Main Street, Saturday, May 19, 2018 from 9:00 a.m. – 3:00 p.m. and shoppers will enjoy the selection of plants, garden accessories, yard art, jewelry, clothing, beauty products and more. Plus, organizers are planning space for food vendors, children’s activities, live entertainment and exhibits of local art. Start your day at the City tent at Coffee with the Mayor from 9:00 a.m. – 11:00 a.m. with coffee provided by Kindred Coffee Roasters. Don’t miss the West Chicago Garden Club plant sale. Stock up on natives, annuals, perennials, and vegetable seedlings. Stop by Ball Horticultural Company’s “Wave Van” to learn about new flowers and vegetables. Ask questions and share stories about your garden! Visit 103 W. Washington Street., the home of Gallery 200, for The GardenWorks Project’s organic plant sale and used garden tool giveaway (while supplies last). Need some gardening guidance? Attend a gardening class at 1:00 p.m. titled "Your Vegetable Gardening Questions Answered". The City of West Chicago booth will feature a “One West Chicago” community engagement activity for children, with the opportunity for participants to earn a prize (while supplies last). The City will also be distributing 500 free “Goodie Bags” filled with coupons, flyers, and takeaways provided by local West Chicago businesses. Children won’t want to miss the Healthy West Chicago Children’s Area which will feature jump ropes, hula hoops, sidewalk chalk, and face painting. Check out the Chicago Corvette Club Car Show along Main Street. The Club invites children to race matchbox cars down the Kids’ Track. Kids can keep the cars in return for donations to Lurie Children's Hospital. Also worth noting is the Main Stage entertainment schedule provided by People Made Visible which will include musical performances, Zumba, a boxing demo and more. Blooming Fest is organized by the City of West Chicago and a committee of dedicated volunteers. For more information or questions, contact Bethany Bayci at bbayci@westchicago.org. 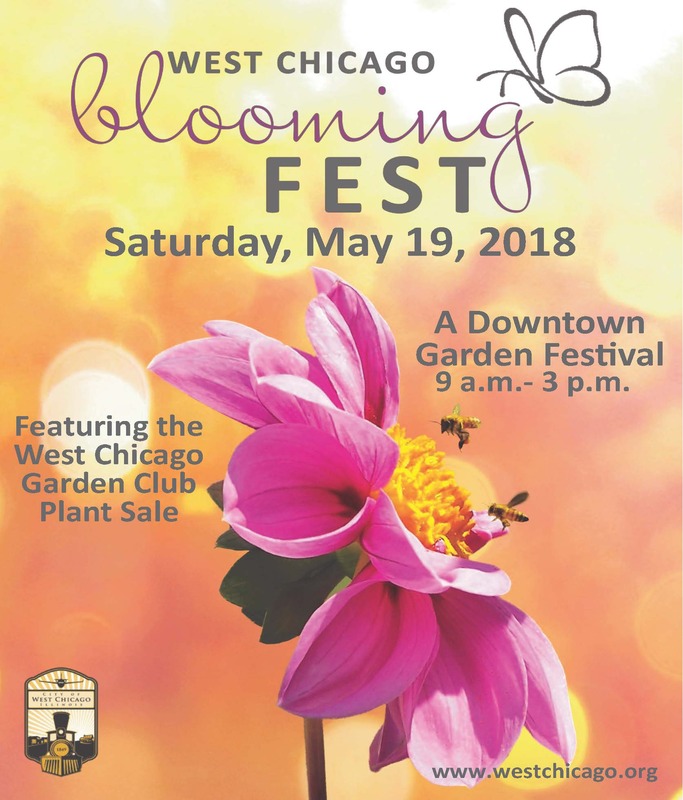 To view a new video which highlights Blooming Fest and all of West Chicago’s special events that take place throughout the year, visit https://www.youtube.com/watch?v=yw8bR2qOjHA.